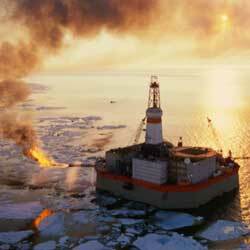 HXR Drilling Services has significant experience in Arctic Drilling operations. The Arctic is viewed as vital to the world’s future supply of energy. All of the countries with territories or economic zones encompassed by the Arctic Circle are actively leasing or have leased blocks for exploration. Here in the U.S., the North Slope/Colville River Basin has been actively explored since the 1970s and new fields are still being found. Offshore, the Beaufort and Chukchi Sea leases and the Arctic Ocean are expected to contain significant amounts of recoverable oil reserves. Arctic drilling services, in most cases, encompass several disciplines — extended reach drilling, conventional horizontal drilling and offshore drilling — in addition to the added hardships inherent in such harsh environmental conditions. From pad drilling and artificial islands, to methane-hydrates, to unstable gravels in the permafrost, Arctic drilling services pose significant technical challenges. HXR’s Drilling Engineers, Drilling Specialists and Drilling Supervisors have weathered the cold in these harsh regimes and add value to our clients’ operations immediately. Using our specially developed, extended reach drilling software, ERDPro®, our office-based Drilling Engineers and rigsite-based Drilling Specialists can design and monitor even the most difficult of our clients’ wells.